Catch the excitement at parties and corporate events! 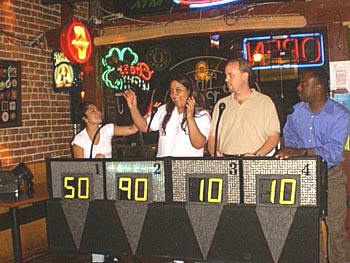 Our high tech game show entertainment system has zany sound effects and digital scoring. We can customize the questions to fit your party’s theme with trivia questions and sound clips for music, movies and TV trivia. Perfect for events such as rehearsal dinners, team building, reunions, holiday parties, nightclubs, parties & fund raisers. • For non-singers, we provide “Game Show Mania,” a unique TV-style game show that includes trivia questions that you can customize for your event. • Try Game Show Mania for kids! It’s a popular game at birthday parties. • This fast-paced trivia game provides lively entertainment for parties and nightclubs.